SJ Fisher Construction can help you enjoy the outdoors with a new porch or deck addition. We can design and build any style or custom configuration. This year-round greenhouse is truly unique. 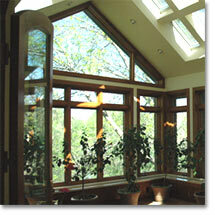 A beautiful ambiance is created with floor to ceiling windows and skylights. Twenty-six skylights open and close with remote control operation. Special features include a built-in channel with running water and drains so that potted plants can be automatically watered.